I managed to find some Tim Holtz Adirondack Alcohol Ink Cardstock at my local Michaels. Sorry Hobby Lobby… you were seriously lacking in this area! So off to play I went! 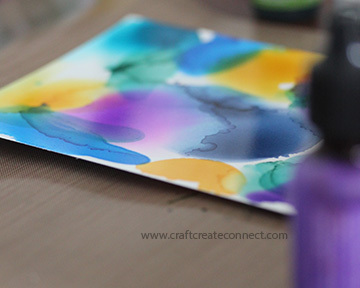 Using 91% alcohol along with my Tim Holtz inks, I began to drop color. It blended and pushed. It mixed and ran. Gravity in my slightly slanted old house became apparent! The question became… on a glossy surface, how do you control a substance that has its own mind. The answer… you really can’t and you know what? That’s what makes it so fun! 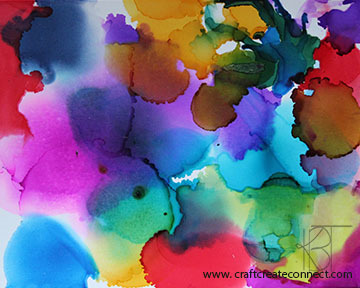 I think I will be playing a lot more with alcohol inks during this 30 day challenge! They are so bright and so vibrant and bring out my inner impressionist. Thanks for reading and looking! Oh wow, love that….the red just pops! Beautiful Kim! Thanks Patti! It was fun to do :)… still learning! Such vibrant colors! Beautiful! 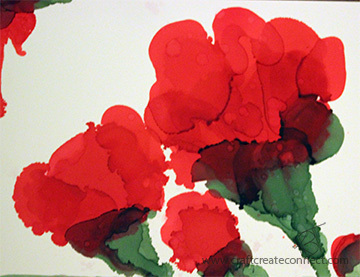 And letting go of control in our art can have the most beautiful results! I know it! Thanks so much for stopping by and taking the time to comment!